Maxseal filter regulators are a high-quality range of stainless steel filter regulators. In association with IMI Norgren, Maxseal produce efficient and durable products that are long-lasting and durable. At Fluid Controls, we supply a wide variety of filter regulators including the Maxseal IFR3 and IFR4. Maxseal filter regulators provide accurate control of downstream pressure, whilst guaranteeing water and particulate removal. Filter regulators ensure an optimum and safe supply of compressed air to pneumatic equipment. The IFR range of filter regulators from Maxseal provides accurate pressure control, ensuring set pressure with increasing flow while saving space. At Fluid Controls, we can help you to select range, size, pressure range, drain type and bowl type to suit your specific application and requirements. Within our range we can supply the Maxseal IFR4 and IFR3. 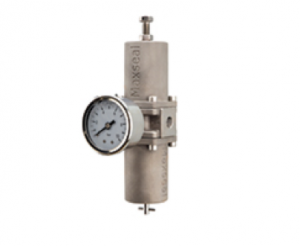 The Maxseal IFR3 and IFR4 are a reliable and long-life range of filter regulators. With ATEX classification, these filter regulators are suitable for marine, offshore, food processing and dental applications. For more information on the Maxseal IFR3 or IFR4 contact Fluid Controls today on 0118 970 2060 or via email at fluid@fluidcontrols.co.uk.